Organic Seed Alliance regularly publishes and distributes resources free of charge. 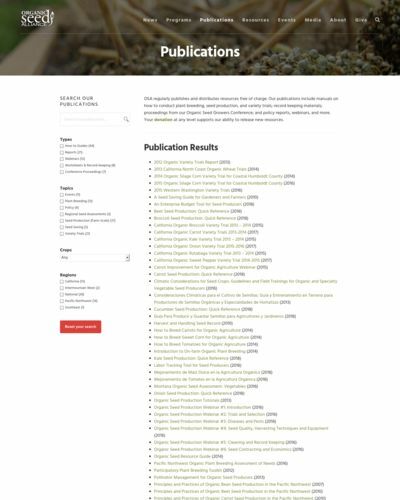 OSA's publications include manuals on how to conduct plant breeding, seed production, and variety trials; record keeping materials; proceedings from our Organic Seed Growers Conference; and policy reports, webinars, and more. The Harvest and Handling Seed Record is a sheet used to track annual seed harvesting and handling details, including weight, damage, harvest dates, seed sources, cleaning methods, storage conditions, and germination details. The Seed Crop Record is a sheet used to track annual seed crop production, including crop location, emergence details, cultivation methods, harvest dates, selection characteristics, and disease and pest damage.